Silicon Motion's second-generation NVMe SSD controllers have all but taken over the consumer NVMe SSD market. Drives like the HP EX920 and ADATA SX8200 currently offer great performance at prices that are far lower than what Samsung and Western Digital are charging for their flagship products. 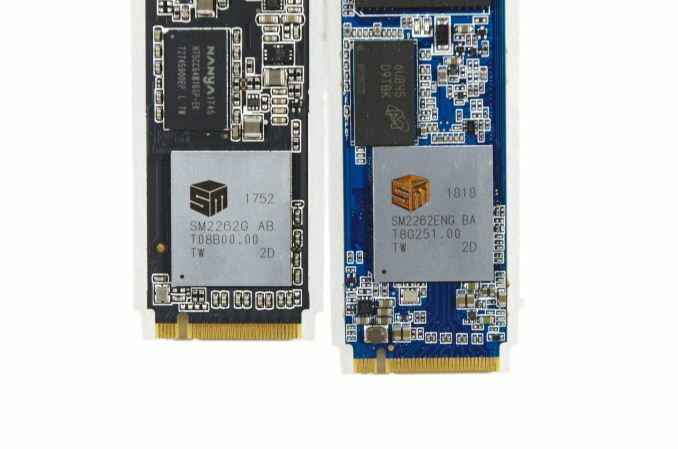 These Silicon Motion-based SSDs are using the SM2262 controller - the high-end member of SMI's current lineup - but they're almost as cheap as the entry-level NVMe drives that use low-end controllers with limited performance. Phison's second-generation high-end E12 controller still hasn't hit the shelves, so Silicon Motion has no serious competition for the SM2262. But Silicon Motion isn't standing still. They've prepared an update to the SM2262 controller called the SM2262EN. This was first previewed at the same time that the SM2262 was announced, but Silicon Motion didn't provide much guidance on the timing. The SM2262 controller hit the market with the Intel SSD 760p in January, and the SM2262EN is almost ready for release. With the SM2262EN, Silicon Motion is promising substantial performance improvements that go well beyond what we usually see from firmware optimizations, though the hardware changes relative to the SM2262 are minimal. The updated controller should hit the market in time to compete against Phison E12 SSDs and the first wave of drives with 96-layer 3D NAND. 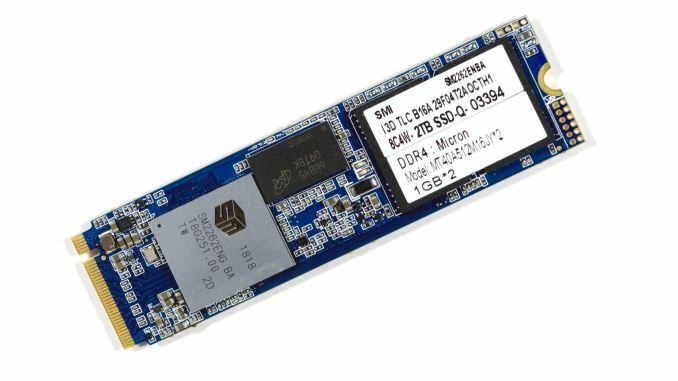 To assess the new SM2262EN controller solution, Silicon Motion has provided us with a 2TB reference design SSD with their latest firmware, a work in progress as Silicon Motion continues to optimize performance. This is a higher capacity drive than any of the SM2262 SSDs we've tested, and some performance improvement may be due simply to the capacity increase. However, even at 1TB we already have several NAND dies on each of the controller's 8 channels, so adding more dies shouldn't have a huge impact, especially not for sequential transfers. This 2TB configuration represents the maximum practical capacity when using 256Gb NAND dies, as it requires four packages with stacks of sixteen dies. The usable capacity is configured as about 2000 GB. The PCB layout is generally the same as for the SM2262 drives we've seen, with one DRAM package and two NAND packages on each side. This drive uses 2GB of Micron DDR4 DRAM, while all of the SM2262 retail drives we've seen use DDR3L. The switch to DDR4 gives a slight improvement to voltage and latency, and a big boost to throughput—which is probably necessary to make the most of the EN controller variant. The use of DDR4 does add slightly to the cost of the drive, but not enough to prevent this change from carrying over into retail products. The DRAM update still leaves Silicon Motion a bit behind Samsung, which has moved its SSDs to LPDDR4 and reaped significant power savings. For this review, the 2TB SM2262EN drive is compared against other recent NVMe SSDs, primarily high-end drives. The results from our engineering sample of the upcoming Phison E12 controller are also included, and these two new controller solutions will probably be responsible for the stiffest competition in the NVMe SSD market segment once they are both shipping in volume. Thanks to StarTech for providing a RK2236BKF 22U rack cabinet. I think there's usually a threshold at which performance drops pretty rapidly because the SLC cache or spare area is no longer large enough. Unfortunately, determining the shape of the curve and where the threshold is (if there is one) is extremely time-consuming, and the tools used for the ATSB tests don't make it easy to test multiple drives in parallel. I did run the Heavy and Light tests on this drive with it 80% full and the results were similar to the 100% full case. But manual overprovisioning like that doesn't necessarily have the same impact that re-tuning the firmware would. A typical variable-size SLC cache won't be significantly larger for an 80% full drive than for a 100% full drive. I had the exact same question. How full is full? If the performance hit did not occur until 95% full or more, then it would be easily avoidable and acceptable (to me). If it happens at 30% full, it's a deal breaker. Or a linear degredation would also unacceptable to me since the degredation is so extreme. Currently, the ATSB tests cut all idle times down to a maximum of 25ms. I suspect that idle times on the order of seconds would be sufficient, but I don't think we even still have the original traces with the full idle times. In the near future I'll do some SYSmark runs with a mostly-full drive; that's a similar intensity of storage workload to the ATSB light, but with a fairly realistic pacing including idle.